“Those who already have the most difficult lives are those most likely to be sanctioned,” said Paul Morrison, public issues policy adviser for the Methodist Church and one of the authors of the report. 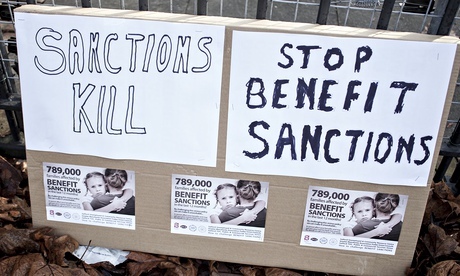 “Sanctions impact disproportionately on young people, care leavers, homeless people, single parents, the mentally ill and those with long term illness. This system causes problems for the very people that most need help. This is worth highlighting – these churches consider the government to be deliberately forcing hunger on people. Doesn’t that run against Article 3 of the Universal Declaration of Human Rights, as enshrined in the UK’s Human Rights Act? Human rights campaigning organisation Liberty says this is the case, with this web page quoting a case study that includes “food and drink deprivation”. “If you commit a crime, no criminal court in the UK is allowed to make you go hungry as a punishment,” added Niall Cooper, Director of Church Action on Poverty. “But if you’re late for an appointment at the Jobcentre, they can remove all your income and leave you unable to feed yourself or your family for weeks at a time. The Archbishop of Wales, Dr Barry Morgan, said: “The findings of this report are disturbing. It exposes a system that is harsh in the extreme, penalising the most vulnerable of claimants by the withdrawal of benefits for weeks at a time. Most worryingly, it appears from DWP guidance, quoted in the report, that deprivation and hunger are knowingly being used as a punishment for quite trivial breaches of benefit conditions. Employers would not be allowed to stop someone’s wages for a month the first time they were 10 minutes late for an appointment, but this is the kind of sanction that is being imposed on some of the most vulnerable people in our society, including those with mental and physical health problems. bringing you the news as it happens. Excellent report. Interesting that yesterday’s article about the US State which has decided to house people as it is cheaper than health care or prison sentences for them. I commented on how this vile government is consistently keen on all the worst aspects of USA but none of the good ones. Of course, we could have any possible badge to rewars keen DWP staff for good work, despite the suffering it causes, but trust this government to use an American sheriff’s badge! I know it sounds cliche, but, I never dreamt in a million years that people in this so-called first-world country would be starving and not through famine, it has been inflicted upon the poor/sick/jobless/disabled by an uncaring self-serving government. I can imagine them slamming the Bible’s teaching. (Matthew 19:21) Jesus said to him [a rich man]: “If you want to be perfect, go sell your belongings and give to the poor, and you will have treasure in heaven”. POLITICIAN TRANSLATION: Damn the poor & treasure in heaven, no one’s getting my money, no matter who’s in need. Whoa! Hey – don’t go making the mistake the government wants you to make. You must not play their “divide-and-rule” game of saying “Here’s a named group; we’ll demonise them”. There isn’t a single real Christian in the Parliamentary Conservative Party. Their acts during the current Parliament demonstrate that. Some of them actually have different religions – Baroness Warsi, for one – but all have turned their backs on the teachings of these organisations. We have a SECULAR government. In case you haven’t noticed, this very article makes it clear that the Christians in our community don’t want anything to do with Cameron and his gang. Allah said that it is harder for a rich man to get through the gates of heaven than for a camel to pass through the eye of a needle. And there is the saying – Alms for the love of Allah. Religious people are being called outright liars for saying the truth that welfare and pension reform is the direct cause of starvation. In fact, Jesus made the comment about the rich man and the eye of the needle. Somebody had said something similar on Twitter a day or so ago and your comment both reminded me of it and suggested to me that somebody might be stirring up some sort of sectarian nonsense. I’m very glad that’s not the case. I didn’t know anything about your religious views. Put yourself in my position – I bet you would have been suspicious too. I didn’t see my comment as anything other than satire. No – it was the context in which it arrived here that created the illusion. Anyway, it’s cleared up now. I think it can only be the latter, illness disability can happen to anyone at any time in their life – are they all so blind? Good on the Church; let’s hope they pursue this with a vengeance. One of the founding principles of the modern welfare state is that no-one should have to rely on charity when in need (“the rich man’s to give or withhold”, and I would add that the Church does fall under that umbrella too, past & present). I just think that many, many people really don’t understand the seriousness of what has been done to our most vulnerable – those in need. The concept of the welfare state is so ingrained that people who are not “in need” think that it does actually still work. Those on the thin end of the wedge have problems enough just surviving both physically and mentally, but somehow many are organising, protesting, and doing all they can. It doesn’t help that the Lobbying law has now silenced those who should be part of the fight back. But most of all, I totally agree, why is there no support in the wider community? WHY? I really wish that was true, but I know people extremely close to me who seem to be convinced that it’s all for the greater good. Who would imagine you could have a conversation with a fellow human being (a church goer) in a 21st century Christian country that runs along the lines of “how many of those people would have died anyway?”. I find it deeply deeply depressing. Isn’t it just? Yet in this example their church is actively donating to food banks and other charities and they seem unable, or unwilling, to see the irony. I am at a loss. What so-called Christians? The Coalition government is secular. I do apologise; your comment was not made as a reply to anybody so I was taking it as a response to the article itself. i had actually clicked on the reply button for stilberry but no matter. its now cleared up. sorry for the confusion i caused. No need to apologise; these things happen, for reasons known only to website programmers, I’m sure.